Cells in the immune system are tuned exquisitely to avoid the extremes of immunodeficiency and autoimmunity. 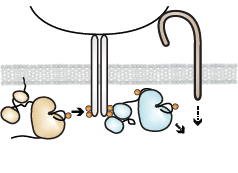 We apply the tools of biochemistry, immunology, biophysics, and structural biology to understand macrophage and lymphocyte signaling with the goal of understanding how inflammation and dysregulation can affect cell sensitivity and exacerbate disease, how protein-protein interactions at the plasma membrane regulate signaling, and how receptor clustering enables signaling. Click on each project above to learn more! Hard at work on revisions for PhD student Ben Brian's mansucript resubmission! We now have a lab Twitter account! Follow @tfreedmanlab for the latest goings-on. PhD student Ben Brian just submitted his first paper, which includes a beautiful comparison of macrophage and mast cell signaling. Check out a preprint at bioRxiv doi:10.1101/550053. PhD students Dechen Wangmo and Aditi Bapat are spending their third rotation with us! Looking forward to investigating signaling in human macrophages and studying how Src-family kinase signaling shapes the breast tumor microenvironment! MICaB and Pharmacology students in our lab are eligible for Pharmacology Department Awards, which recognize stellar research proposals, scientific leadership, and publications and subsidize travel to conferences. Please join us in welcoming researcher Adrienne Jolicoeur to the lab! Adrienne and Myra will be working together to study myeloid-cell signaling in isolated cells and in the context of autoimmune arthritis. Thanks to the University of Minnesota Foundation and the UMN Medical School for a Faculty Equipment Award! The requested near-infrared imager is essential for us (and our colleagues) to do quantitative research in cell signaling! Thanks to Dean Jakub Tolar for recognizing our research as part of the 130th Anniversary celebration for the UMN Medical School! Thanks to the NIH (National Institute of Arthritis and Musculoskeletal and Skin Diseases) for funding our R01 grant (AR073966): "Roles of the Src-family kinases LynA and LynB in macrophage inflammatory signaling!" We are excited to begin this work and acknowledge important discussions and collaborations with colleagues Bryce Binstadt, Marc Jenkins, Kaylee Schwertfeger, and Cliff Lowell! PhD student Ben Brian is preparing a manuscript for publication! Stay tuned for more about LynA and E3 ubiquitin ligases! Please join us in welcoming Myra Nunez to the lab! Thanks to the UMN Center for Autoimmune Diseases Rssearch (CADRe) for a Pilot Grant to fund our first studies of human macrophages and inflammatory arthritis! PhD student Ben Brian gave a research talk at the UChicago/UMN Immunology Retreat on his recent discoveries about ultrafast degradation processes in Src-family kinases and a novel model for studying breast cancer! 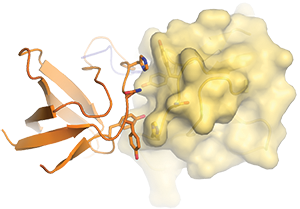 We are now studying the roles of Src-family kinases in autoimmune arthritis, thanks to "New Mouse Award" funding from the UMN Center for Immunology! We are hard at work making new mouse models to study the unique functions of the Src-family kinases LynA and LynB! Thanks to the National Institute of Allergy and Infectious Diseases at the NIH for the funding to get this exciting project started! PhD student Ben Brian gave a terrific talk at the Autumn Immunology Conference in Chicago! Go Ben! Thanks to the American Cancer Society for a UMN Masonic Cancer Center Instutional Research Grant! Tanya is now a member of UMN's Microbiology, Immunology, and Cancer Biology (MICaB) Graduate Program! Since their admissions priorities vary independently from year to year, potential PhD students are strongly encouraged to apply to both MICaB and the Graduate Program in Pharmacology. Whitney Swanson joins the lab! Please join us in congratulating our Researcher Frankie Sjaastad, who will leave the lab pursue a PhD in the MICaB Graduate Program! Ben Brian, a Pharmacology PhD student, joins the lab! Thanks to the UMN Office of the Vice President for a Grant-in-Aid of Research, Artistry, and Scholarship! We are happy to welcome Ben Brian, a rotation student from the Pharmacology Graduate Program! Check out our new paper in eLife! "LynA regulates an inflammation-sensitive signaling checkpoint in macrophages"
Thanks to the University of Minnesota Foundation and the UMN Medical School for a UMF Faculty Research and Equipment Award! Avin Persaud and Frankie (Rosie) Rossini join the lab! Frankie Sjaastad joins the Freedman Lab! Tanya becomes a member of the Graduate Program in Pharmacology! Tanya moves into her office at 3-190 WMBB and her lab space at 2-200. Drop by and say “Hi”!